What will surprise the tourist arriving in Abruzzo for the first time is that in just a few km, the landscape changes from sunny beaches to soaring Apennine peaks flanked by villages, castles, abbeys, lakes, Parks and Nature Reserves. All inland towns and villages offer a continuous calendar of events like historical pageants, patron saint festivals, open-air dances, folklore performances, concerts, and culinary stands that add sparkle and flavour to a simple evening. A "trabucco" is a massive construction built from wood, which consists of a platform anchored to the rock by large logs of pine. Long arms called antemna stretch out suspended some feet above the water and supporting a huge, narrow-meshed, net (called trabocchetto). Spread along the coast of southern Adriatic especially in the Italian province of Chieti, continuing in the Regions of Molise and Apulia. 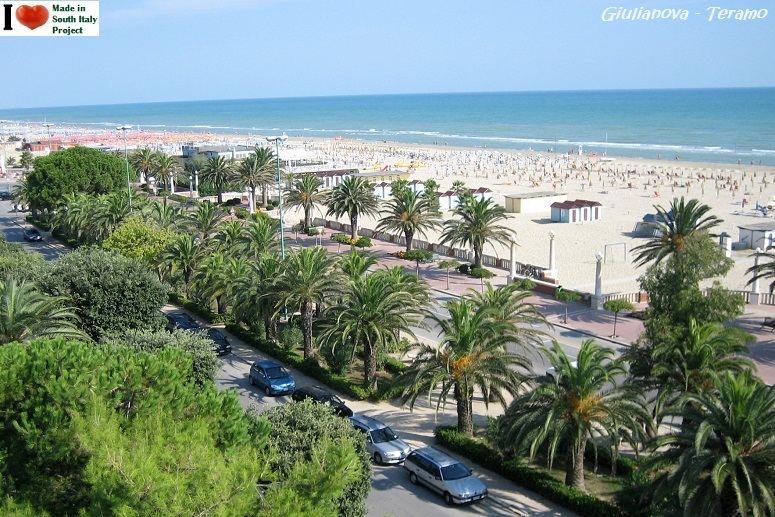 Roseto degli Abruzzi, more commonly Roseto. It is the second largest city in the province. 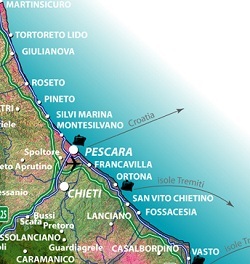 In the last decade the city has witnessed a good deal of growth in the quarters of Borsacchio slightly to the north, Campo a Mare along the seacoast and Voltarrosto to the west. Silvi stretches from the Marina to Silvi Paese up in the hills. The Belvedere of Silvi Paese, perched on top of a hill, 250 metres (820 ft) above sea level, which duplicates the once defensive garrison against the Saracens and offers a spectacular sight on the whole Central Adriatic, sweeping from the Croatian coast to Monte Conero (N) and the Tremiti Islands (S) on a clear day. According to tradition, the town was founded by Diomedes, the Greek hero. The earliest archaeological relics date to 1300 BC, evidence of the first settlements. 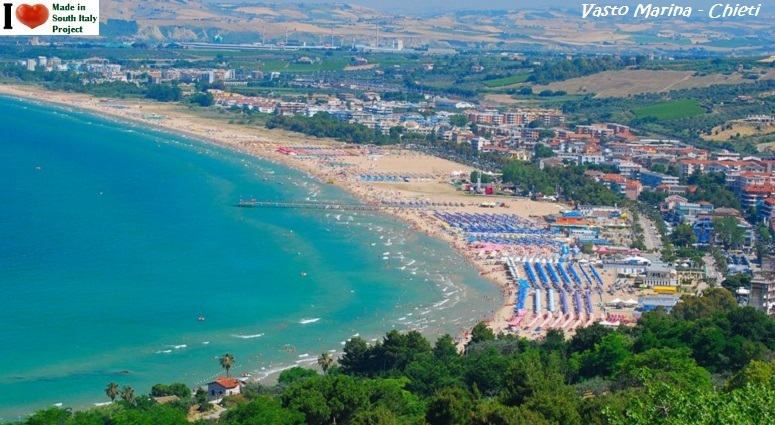 Vasto is the home of Harvard University's Summer Program in Abruzzo, an intensive Italian language program for Harvard students. 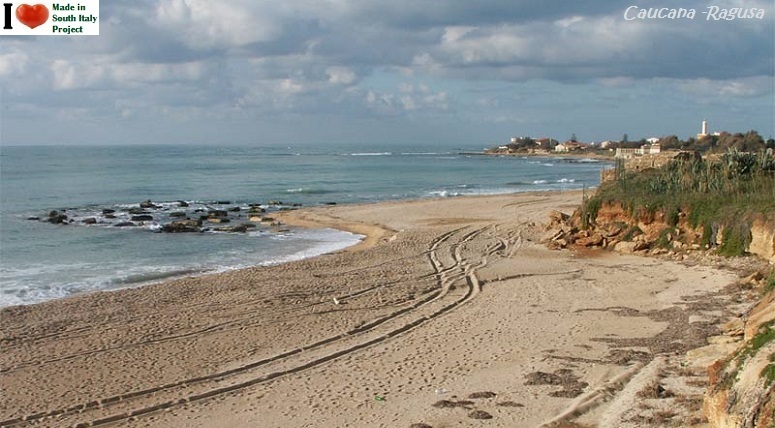 slightly north of the spur in northern Puglia that juts out into the sea. Although Molise’s coastline isn’t as long as some of its neighboring regions, the lack of people makes it an enticing destination for some tourists looking for that slower pace of Italian life they’ve heard so much about. 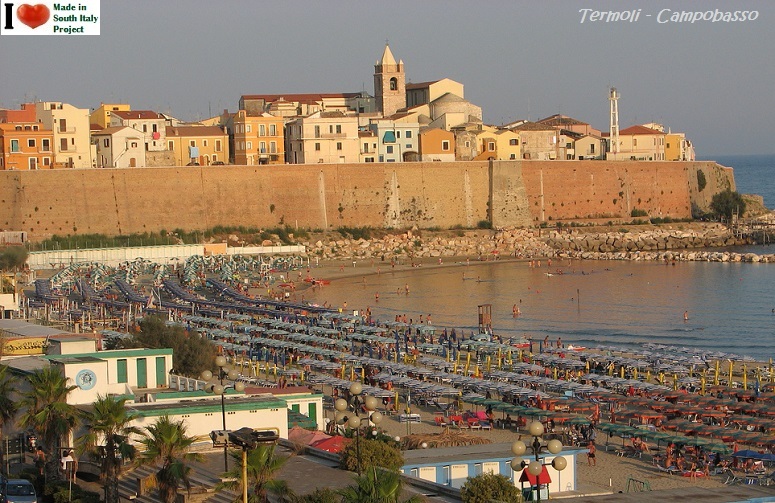 Of all the Molise riviera, Termoli is the most important bathing tourist center, thanks to the beauty and clean beaches but also to the hotels and sport structures, always available. 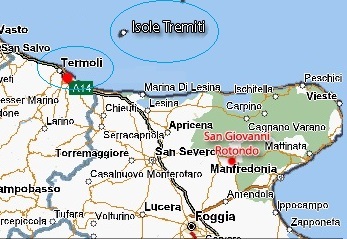 From Termoli departs the transport services to and from the Tremiti Islands, whith several trips during the day. About the Tremiti Islands : The Isole Tremiti are an archipelago in the Adriatic Sea, north of the Gargano Peninsula. They constitute a comune of Italy's Province of Foggia and form part of the Gargano national park. The were used for the internment of political prisoners during Benito Mussolini's Fascist regime. The islands are now an important tourist attraction because of the clear waters surrounding them. Up to 100,000 visitors come to the islands in the summer season. 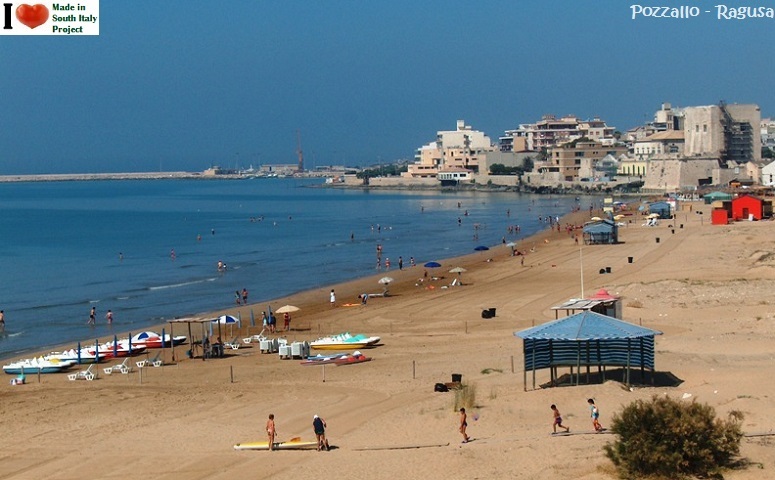 Ferry services from the mainland operate from Termoli, Foggia, Vieste, Rodi Garganico e Capoiale. 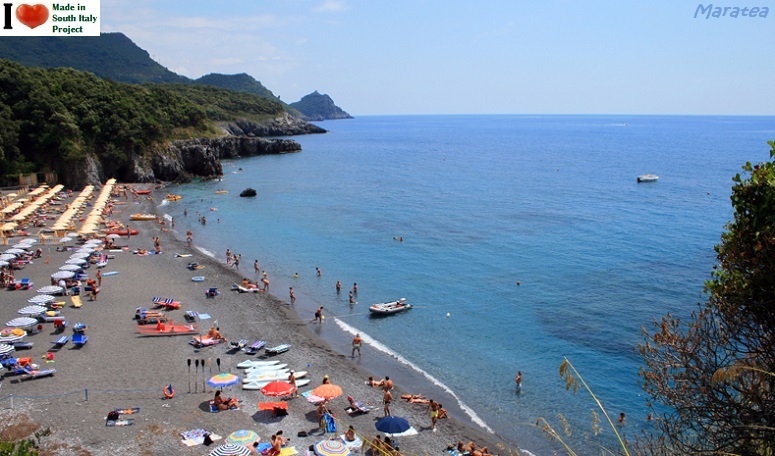 Aside from the popular Amalfi Coast (above pict) there are a few others lesser famous beaches located along the Cilento coast (further south) known to be more children-friendly. 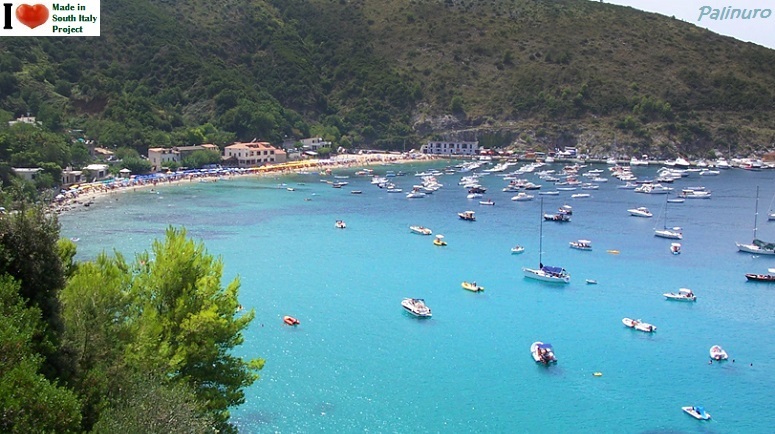 Marina di Camerota boasts one of Cilento's most beutiful, the beach Calanca in particular is the most suitable for families and children with soft white sand, shallow water and well-equipped establishments. 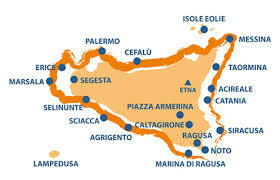 Centola-Palinuro (Salerno), Santa Maria di Castellabate and Sapri also in the province of Salerno. The region is steeped in Greek mythology and legends and a World Heritage Site since 1998. Marina di Camerota (Salerno) is a civil parish (frazione) of Camerota (5km). Month of July and August are the busiest and the ones to avoid...if possible. 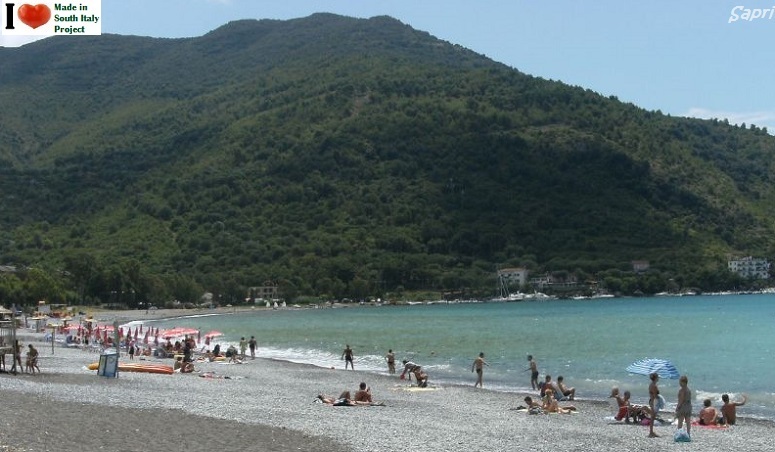 The Calanca Beach ( Salerno province) is one of the main beaches of the nearby Marina di Camerota. Soft white sand beach, bordered by rocky cliffs. Located in the province of Salerno, near Centola, Palinuro is part of the Cilento and Vallo di Diano National Park. According to legend , the name is derived from Palinurus,the helmsman of Aeneas king of Troy, as recorded in the fifth and sixth books of the Aeneid. 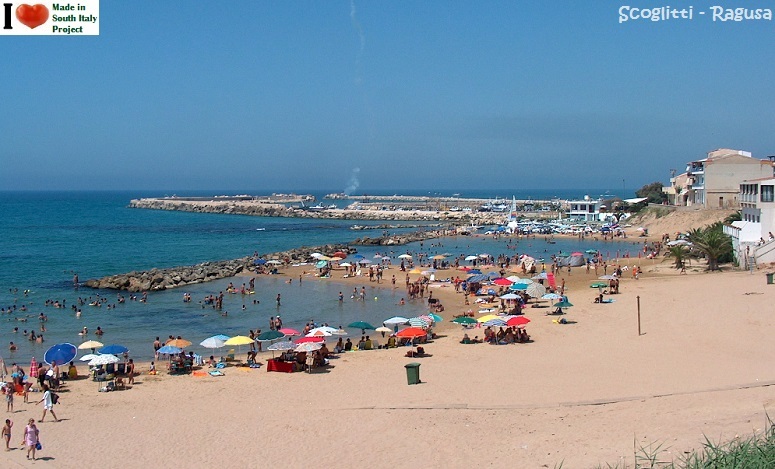 The town is popular with tourists, especially in summer, due to the cleanliness of its waters and beaches; and is regularly awarded a Blue Flag. The town is also famous for the caves along its coast. Santa Maria di Castellabate also named Santa Maria, is a hamlet (frazione) of Castellabate, a municipality in the province of Salerno. 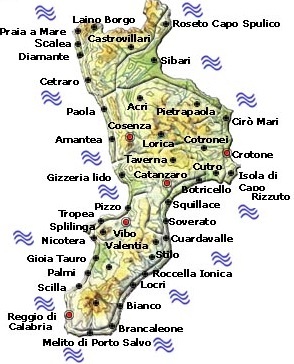 The town is a part of "Cilento and Vallo di Diano National Park". 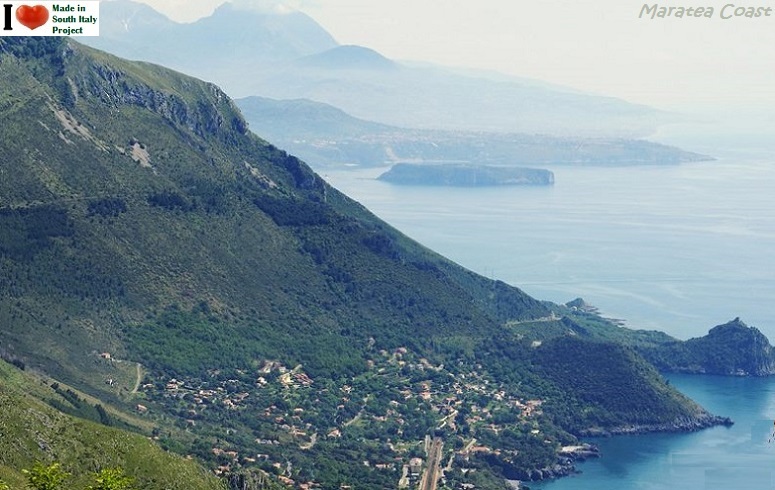 It attracts a lot of tourism, especially in summer, because of good road links to Agropoli, Salerno and Naples and because of the quality of its water. Sapri is one of the southernmost towns of the region of Cilento located in the southern part of Campania, close to the border with Basilicata. 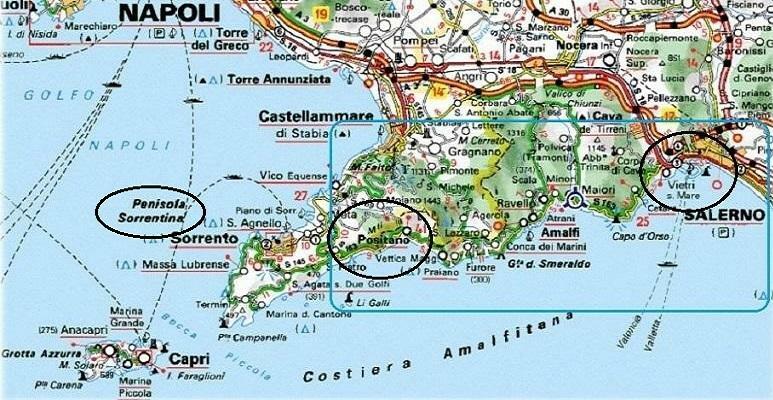 Is only 10 km away from Maratea and almost 100 km from Salerno. 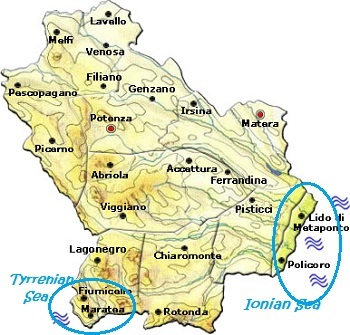 Nova Siri, this area includes the town of Metaponto, Pisticci, and the municipalities of Scanzano Jonico, Montalbano Jonico, Policoro, Marina di Pisticci and Nova Siri. breathtaking paradise not yet discovered. If you are still undecided where to spend a few weeks, this is the place to go. 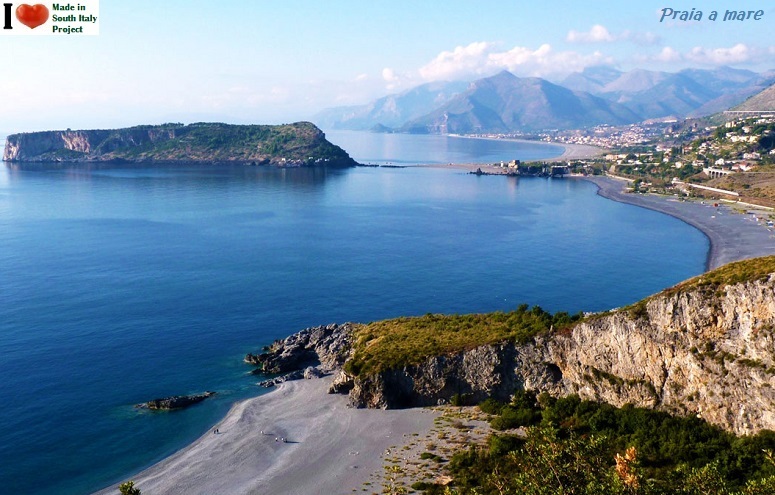 Located in the province of Potenza, Maratea is the only town of the region on the Tyrrhenian coast. 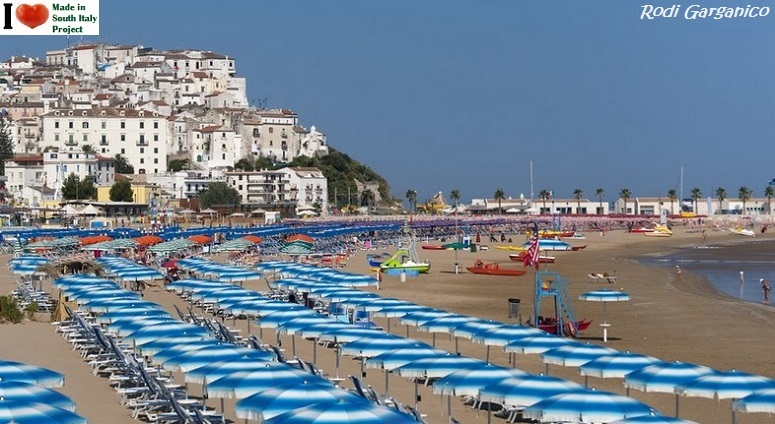 It is also known as "the Pearl of the Tyrrhenian" because of its beautiful scenery and coastline. The marina is located on the southern coast. 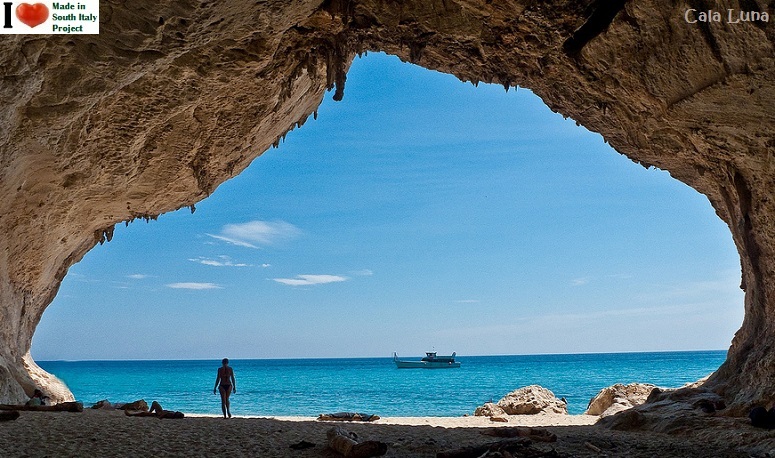 It has beautiful beaches, and an ancient cave. Pisticci is a town comune in the province of Matera and the most populated of the province after Matera. The area is known for being the production site of Amaro Lucano, one of the most famous Italian liqueurs. The Marina has been a seaside resort since ancient origins. 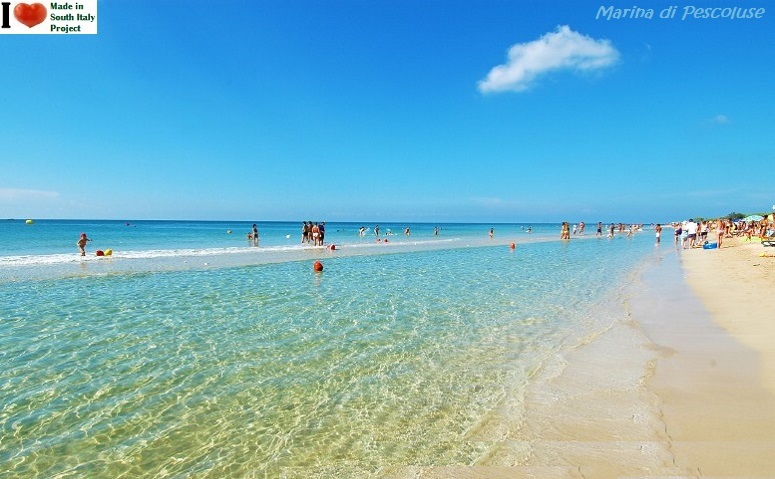 The beach is one of the is one of the most beautiful beaches of the Mediterranean's most beautiful. Characterized by fine sand and clear water, this resort offers the most diverse tourist services. Nova Siri is close to the site of the ancient Ionian colony of Siris and was formed by two small towns: the old, historic Nova Siri Centre ('paese') and the coastal town developed from the 1970s - Nova Siri Station ('Scalo'). The centre is sited on a hill at 350 metres (1,150 ft) above sea level about 9 km (6 mi) from the sea. 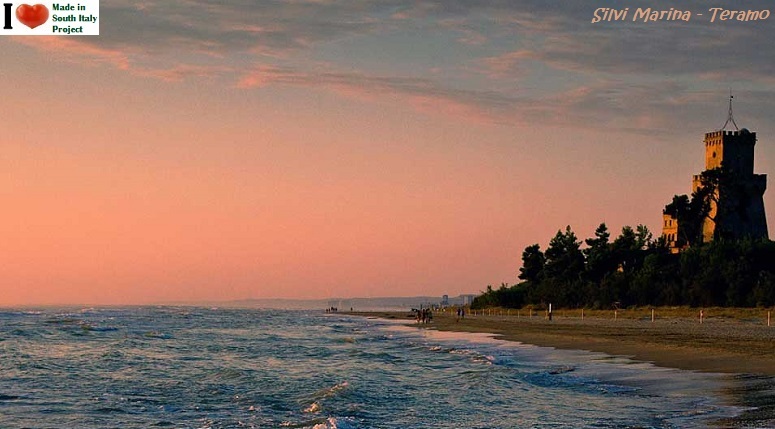 Nova Siri is a popular holiday and tourist destination, thanks to its sandy coast characterized by coastal dunes. 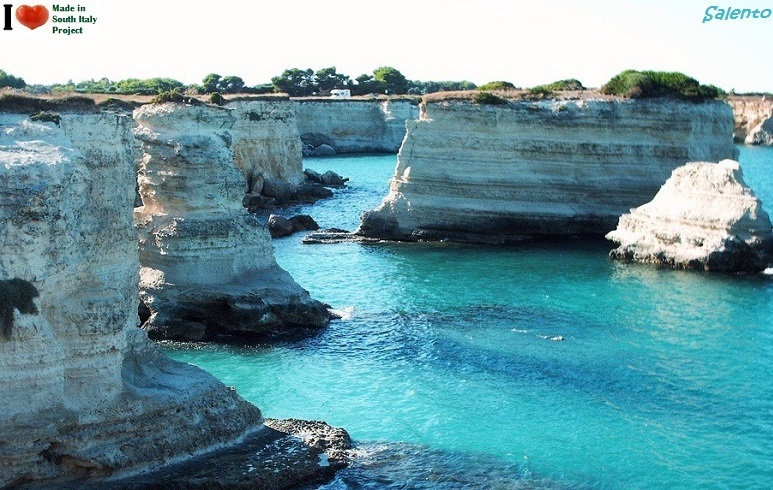 Puglia, is known to be one of Italy's most loved by those who enjoy the sea: 800 km of coastline that are evenly split between sandy and rocky beach with crystalline waters that give you the feeling of being in tropical paradise. The coastline is studded with ports, which make this region an important terminal for transport and tourism to Greece and the eastern Mediterranean. The region has a good network of roads but the railway network is somewhat inadequate, particularly in the south. Gallipoli (Greek: Kallipolis (Καλλίπολις), meaning "Beautiful City". In the province of Lecce. The town is divided into two parts, the modern and the old city. The town of Ostuni (Greek: Astynéon) in the province of Brindisi is located about 8 km from the coast. Ostuni is one of the most beautiful and famous towns in Apulia. Its unique historic town, called "Città Bianca" (the Italian for "white town"), its monuments, its baroque-style churches, are examples of the great architecture and culture that characterizes this part of South Italy. In the summertime its pristine beach is a popular destination for tourists from all over the world​. 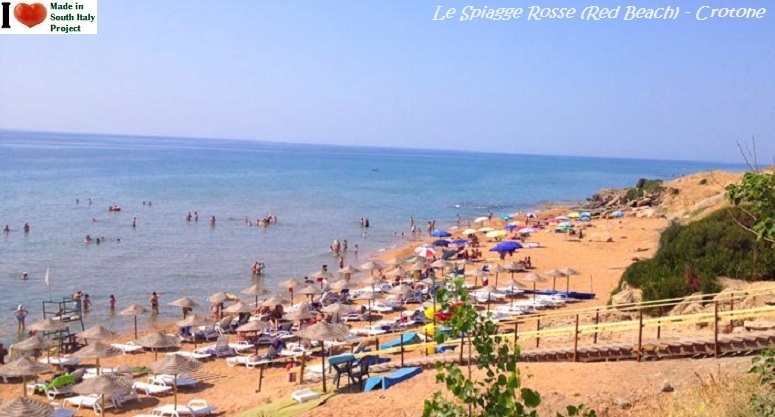 Rodi Garganico is a seaside resort in the province of Foggia, with several long beaches located both north and south to the town. Part of the National Park and of the Mountain Community of Gargano. 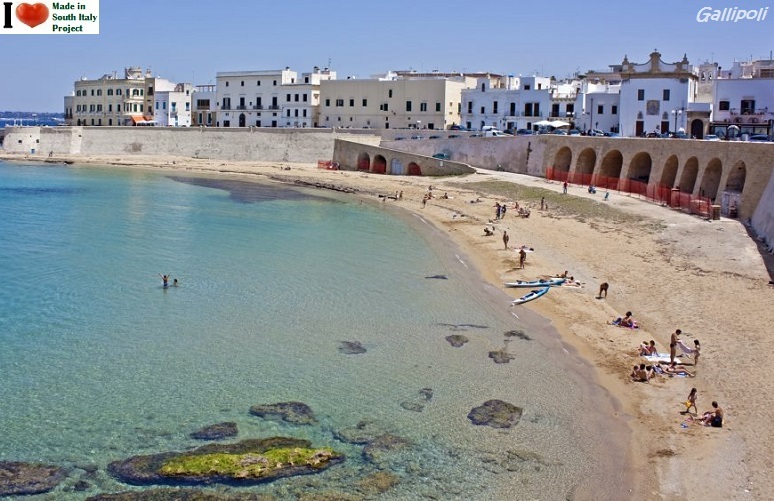 Otranto is a town located on the east coast of the Salento peninsula in the province of Lecce. A fertile region once famous for its breed of horses. The Strait of Otranto, to which the city gives its name, connects the Adriatic Sea with the Ionian Sea and separates Italy from Albania. 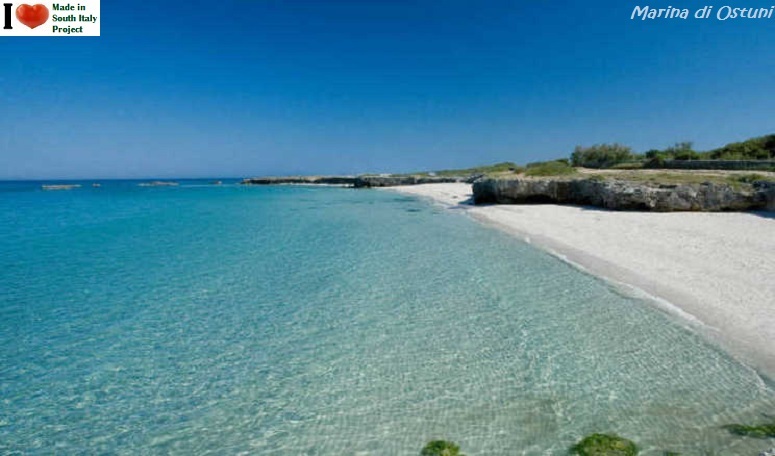 Located in the Lower Salento, in the province of Lecce, between Torre Pali and Torre Vado. Not far from the coast are different karst caves. The lodging industry consist mainly of houses rented out by the inhabitants of the area and some hotels. Alternatively you can stay at Bed & Breakfast, Cottages and Camping. 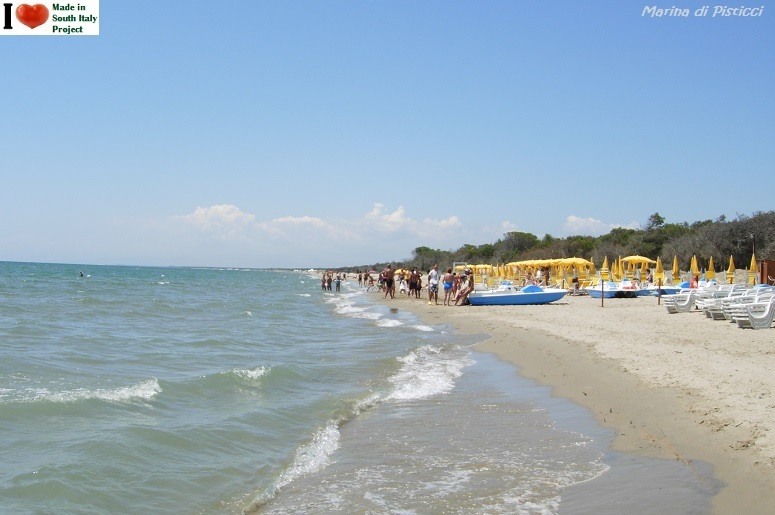 Marina di Lizzano is part of the municipality of Lizzano in the province of Taranto. It is inhabited mainly in the summer. Vast and sandy beaches, mostly of them are public (not equiped) . The color of the sand is very clear, which is why the sea, especially in the days of the north, takes colors and shades similar to the Caribbean or the Maldives. Ginosa Marina was once known as Ginosa Scalo for the presence of the railway station, is located in the municipality of Ginosa (in the province of Taranto). 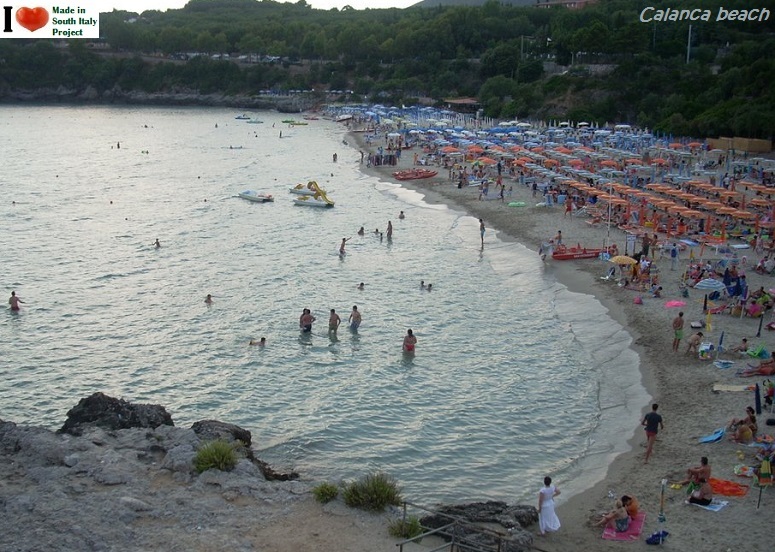 The 485 miles of its coast make Calabria a popular tourist destination during the summer. The region is considered by many a natural paradise, attracting tourists from all over Italy and abroad. 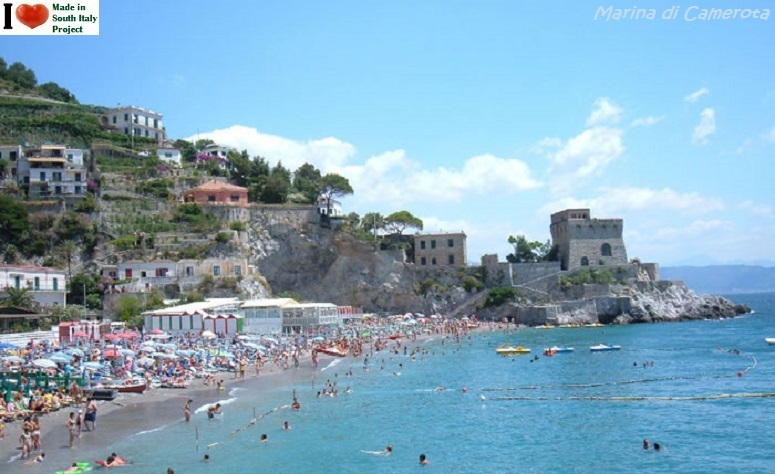 The most popular seaside destinations are: Tropea, Capo Vaticano, Pizzo, Scilla, Diamante, Amantea and Soverato. 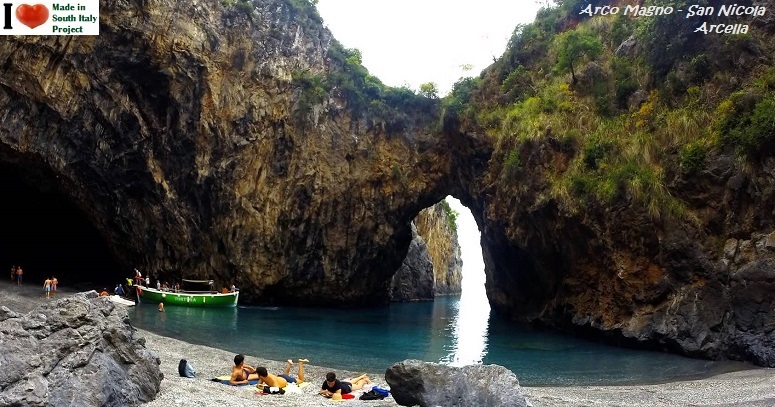 In addition to the most popular coastal tourist destinations, the interior of Calabria is rich in history, traditions, art and culture that attract a discrete number of tourists. Cosenza is among the most important cultural cities of Calabria, with a rich historical and artistic patrimony. Fortresses, castles, churches, and historic centers are common elements in the interior of Calabria. 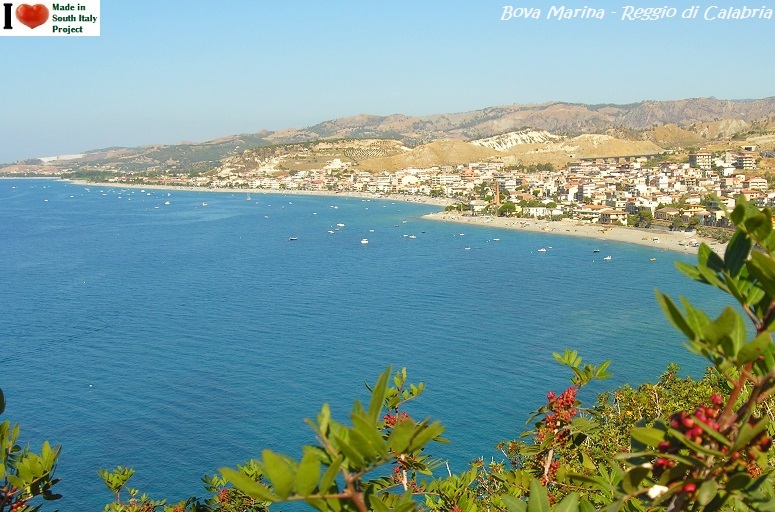 Bova Marina (Calabrian Greek: Jalò tu Vùa) is located about 120 kilometres (75 mi) southwest of Catanzaro and about 30 kilometres (19 mi) southeast of Reggio Calabria. As evidenced by the above Greek place names, Bova Marina is one of the few places where the Greek–Calabrian dialect is still spoken, a remnant of the ancient Greek colonization of Magna Graecia. 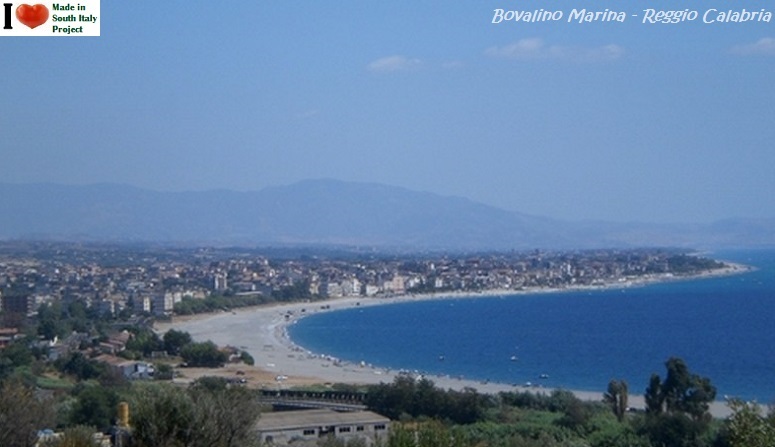 Bovalino is located about 90 kilometres (56 mi) southwest of Catanzaro and about 46 kilometres (29 mi) east of Reggio Calabria. 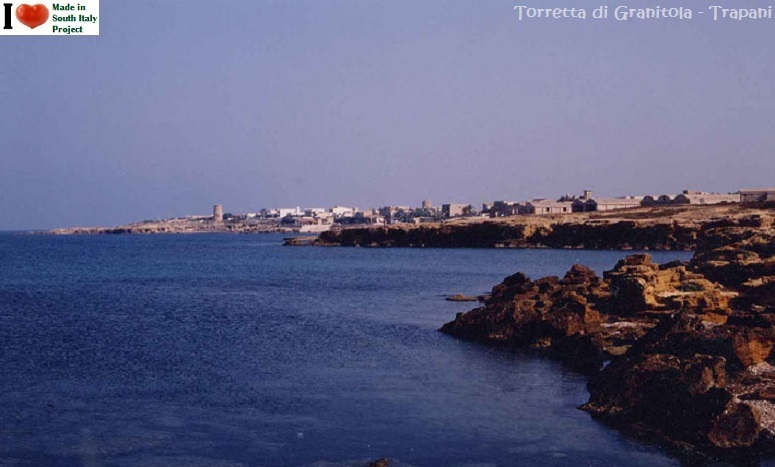 Cirò Marina is a town in the province of Crotone. The area is also famous for the production of wine (Ciro') and olive oil. 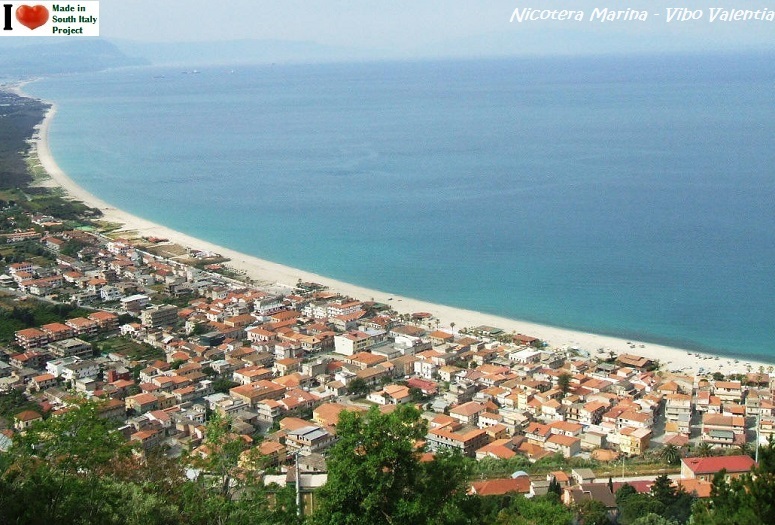 Nicotera (from the Greek: Nikoptera, Medma) is located in the province of Vibo Valentia. It was founded by the Greeks Locresis. 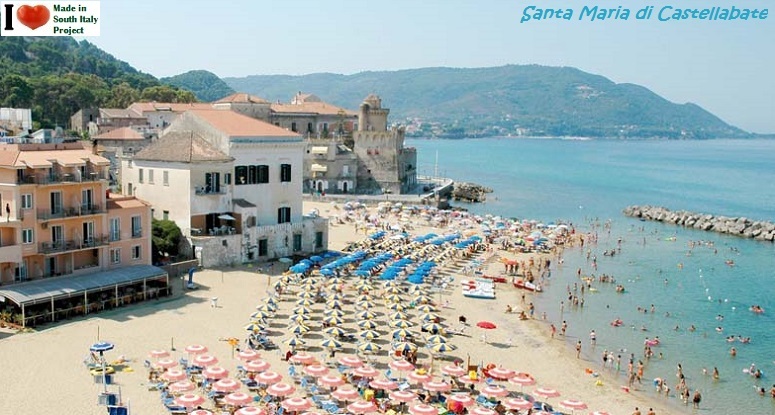 Praia a mare is located in the province of Cosenza and a main tourist attraction. The beach stretches over 2 km, sandy at its northern end but increasingly pebbly southwards. About 100 m from shore sits a rock outcrop called Dino Island which features a number of large sea caves, accessible by small craft and paddle boats. At the most southerly extremity of the beach, a medieval tower, built by Byzantine forces to guard the coast, sits on an outcropping of volcanic rock with a commanding view of the open sea. 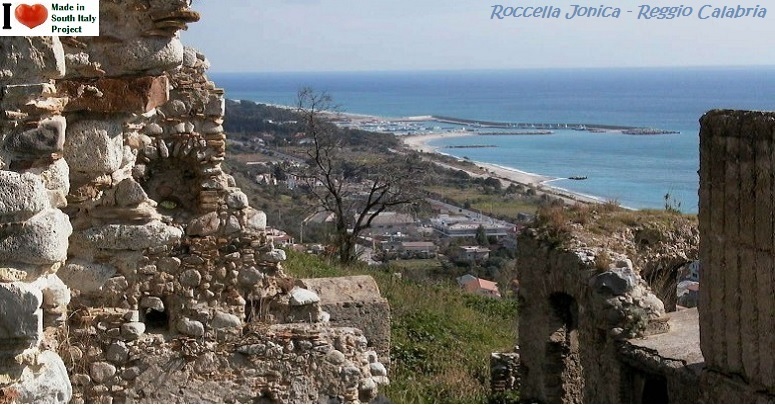 Roccella Ionica (also known as Roccella Jonica or simply as Roccella) is located on the Ionian Sea in the province of Reggio Calabria. Probably best known for hosting a major annual jazz festival. 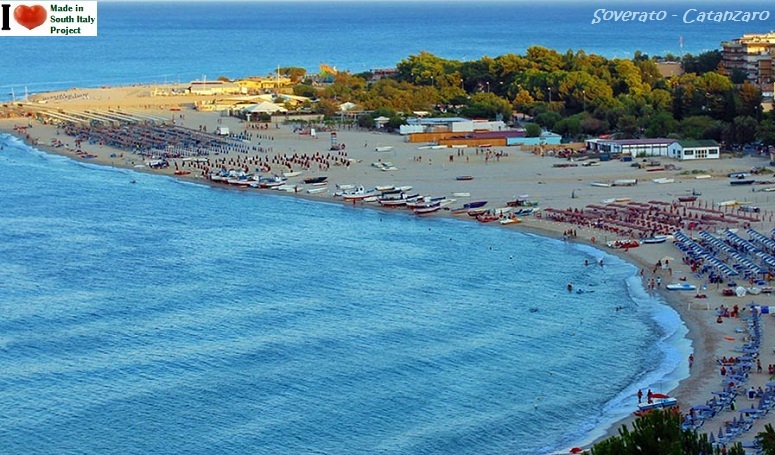 Soverato is located in the Gulf of Squillace, on the Ionian sea in the province of Catanzaro. A string of hidden beaches and characteristic villages are located nearby. 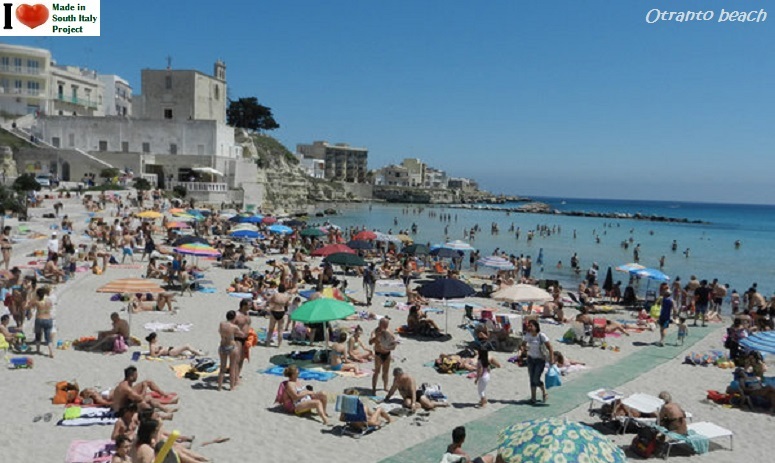 It can be reached via the Lamezia Terme International Airport within a 35- to 40-minute drive. 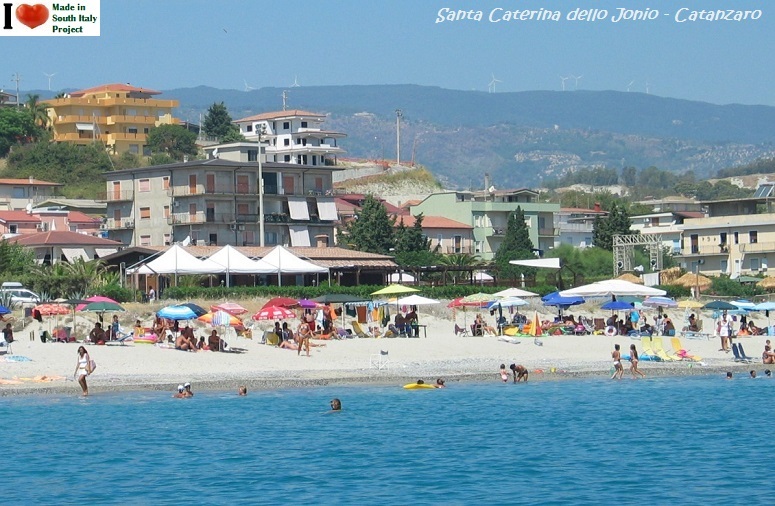 Santa Caterina is located on the Ionian side also in the province of Catanzaro. Pristine beach. Beautiful blue sea. From white and granite sand to rocky coastal cliffs. 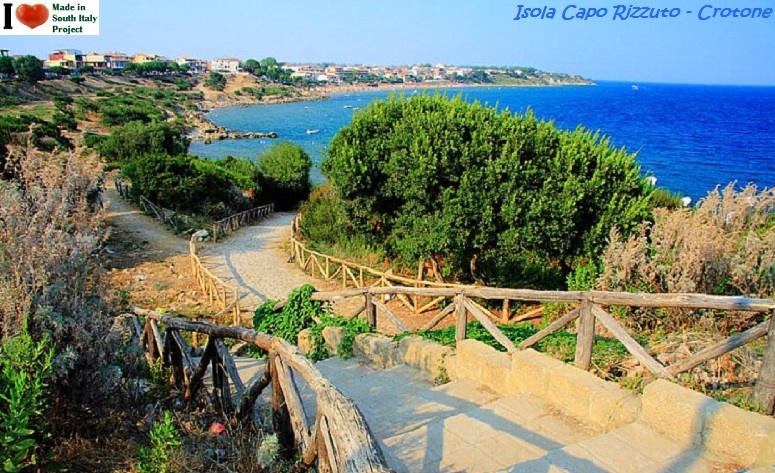 Isola Capo Rizzuto in the province of Crotone - Despite the name Isola (island), the town is entirely on the mainland. There are quite a few beaches to choose from and the area is not as busy as other resort beaches. 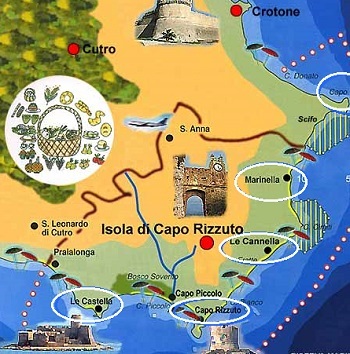 Geographically the seaside district of the town of Capo Rizzuto is a peninsula. 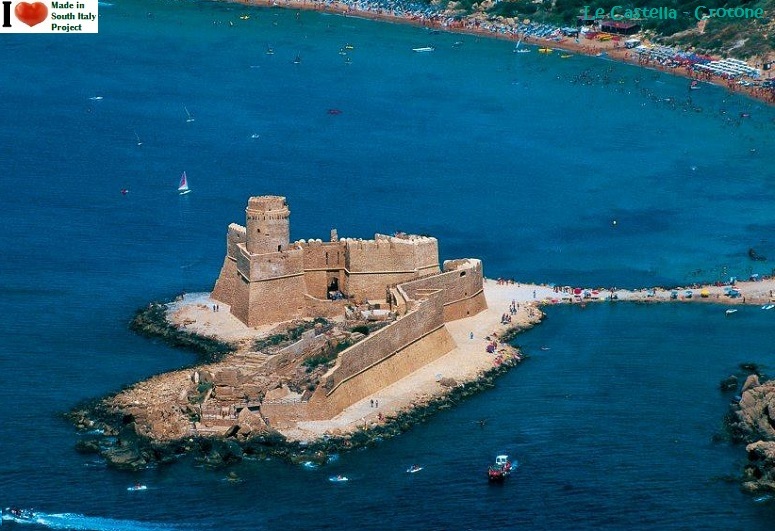 The area's main historical attraction is a 16th-century fortification known as Le Castella, standing on a strip of land connected to the mainland by a narrow causeway. ​Crotone Airport (Sant'Anna Airport) is served by charter airlines. The city of Crotone also has a railway station, although much of the tourism traffic is served by the Salerno-Reggio Calabria highway and the National Road (called 106 Ionica) leading all the Jonic (eastern) coast from Taranto to Reggio Calabria. 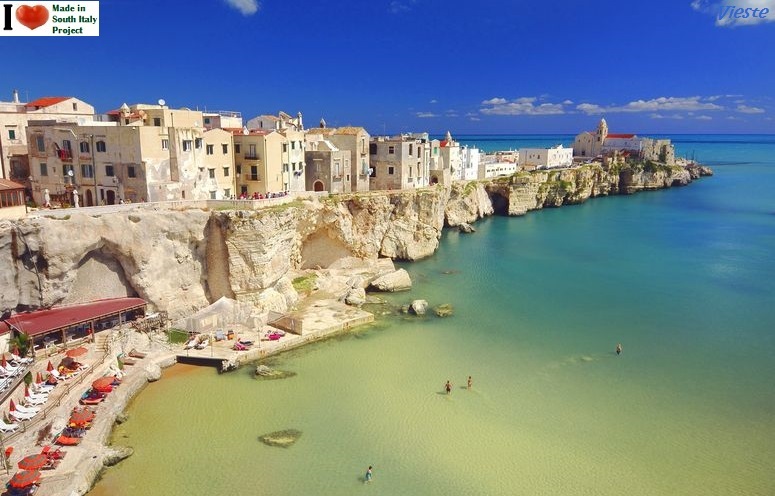 You are on the beaches of Puglia and Calabria . 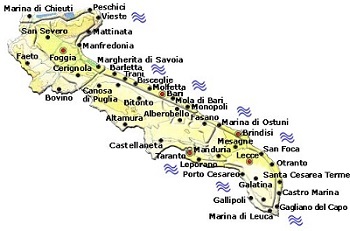 Sicily has a remarkable coastal extension with over 1500 km of coastline ( including the islands). 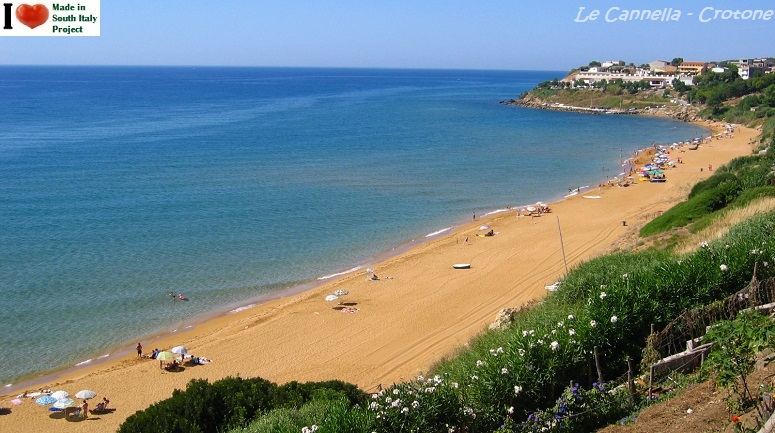 It is the region with the highest number of kilometers of coastline bathing. 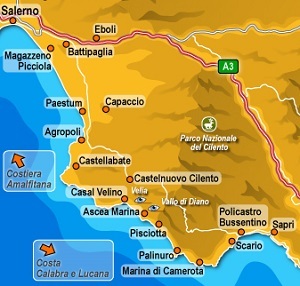 The Tyrrhenian cost is high and rocky interrupted by frequent and large bays, such as the Gulf of Castellammare del Golfo, Palermo, Termini Imerese, Patti, Milazzo and smaller ones hosting long fine and sandy beaches. Small pebble beaches characterizes the stretch of the the east cost (Ionian side) toward Taormina and between the mouth of the river Alcantara and Riposto. 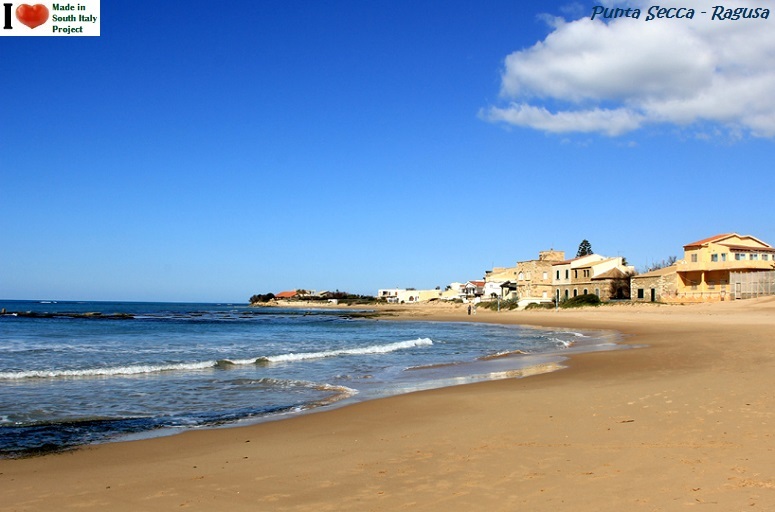 Punta Secca is a small fishing village, in the Santa Croce Camerina comune, in Ragusa province. The village has a lighthouse, a small port and an old watchtower, the Torre Scalambri dating back to the 16th century. In recent times, Kaukana has experienced a boom of settlement by tourists and beachgoers, principly in the summer months, since it is near the main beaches of Punta Secca, Punta Braccetto and Casuzze. 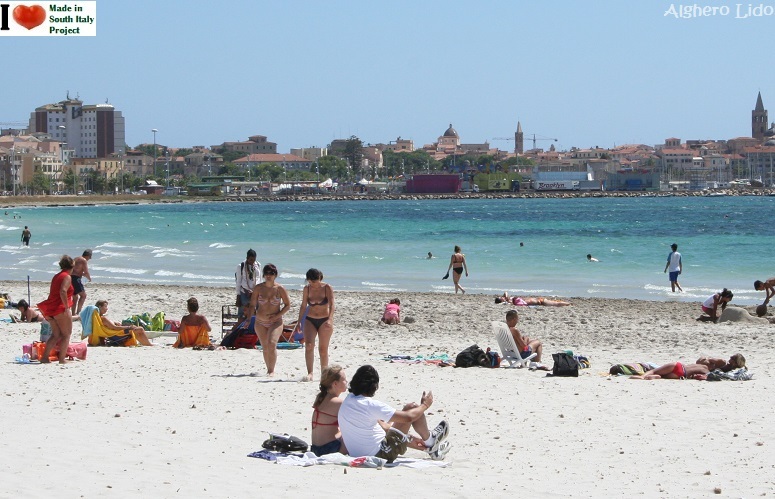 The two main beaches of Caucana are characterised by fine sand and a marvellous sea. The sailing club of Kaukana is well-known meeting place for sailors and hosts important sporting events every year, like the Sicilian 470 class championships. 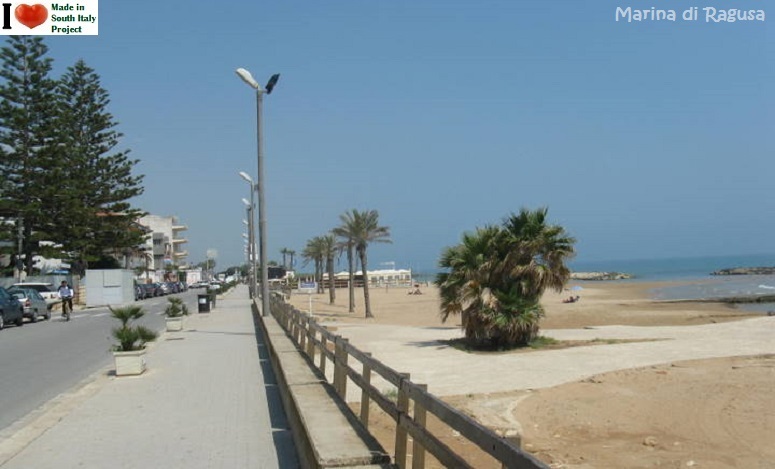 Marina di Ragusa - The site is noted for its beautiful beaches and lively nightlife. 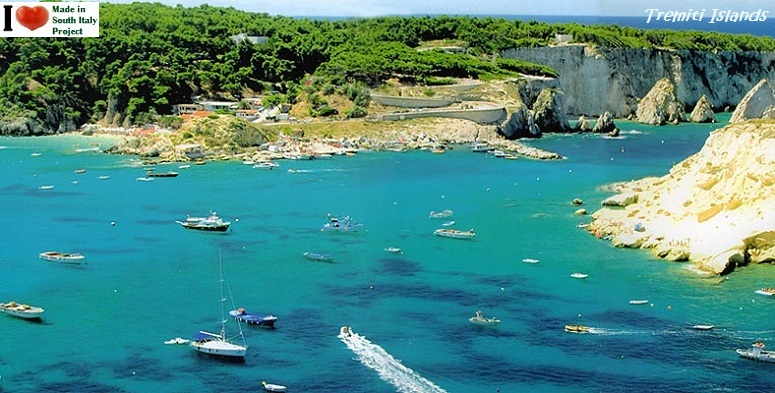 Marina di Ragusa is located on the Mediterranean coast of the island of Sicily, directly opposite the island of Malta. 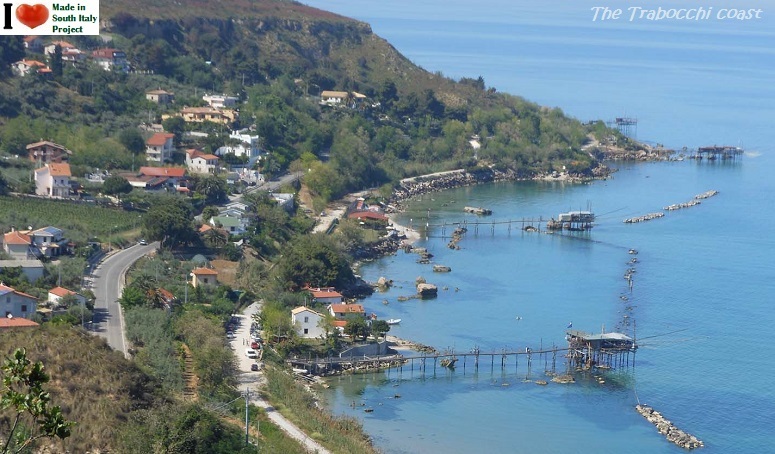 The village was known since the Byzantine era (5th century) when a loading pier was built to export the local products. During the 1960s, it became a tourist resort, a role which it still maintains today. Scoglitti, is a small fishing village near the town in the province of Ragusa. In addition to its fishing industry, the village derives a substantial part of its income from tourism. Notably, the last decade has seen an outstanding growth, with the construction of new tourism facilities. Scoglitti found a niche in history after being selected by the Allies as the site for an amphibious invasion of Sicily made by the US 45th Infantry Division during World War II. 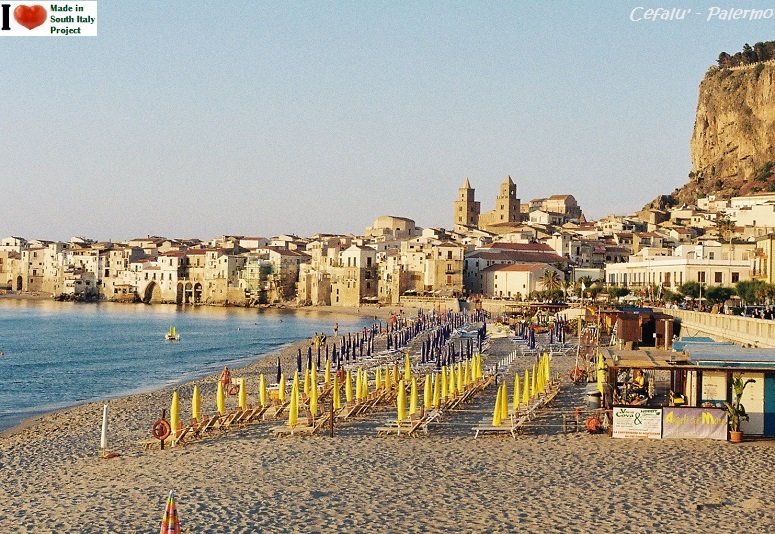 Cefalu' is a city in the Province of Palermo, on the Tyrrhenian Sea about 70 kilometres (43 mi) east of the provincial capital. 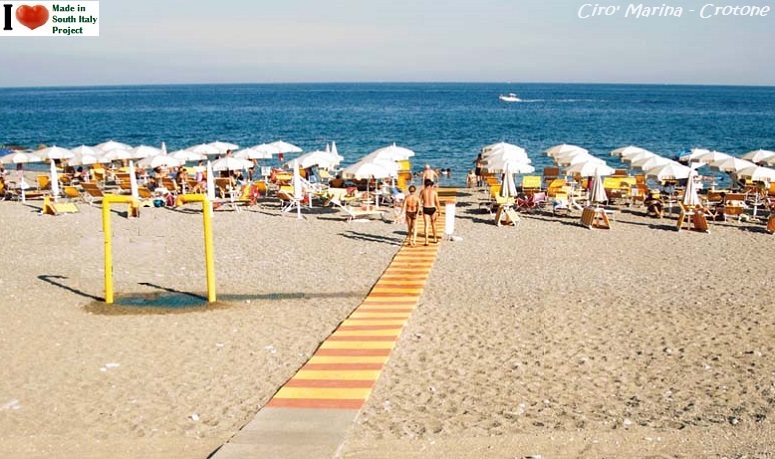 The Lido is the tow's promenade with a beautiful and charming beach. At east is the old port of Cefalu, dominated by the fortress and the Norman cathedral; higher is the old town and to the west you can see Saint Lucia. The coast is about 1.5 kilometers long and is renowned for its fine sand. The sea is blue, clear and with the backdrop that slopes gently toward the sea. In high season and weekends it is almost always overcrowded. Its peculiarity is the background of a massive mountain of white pumice. 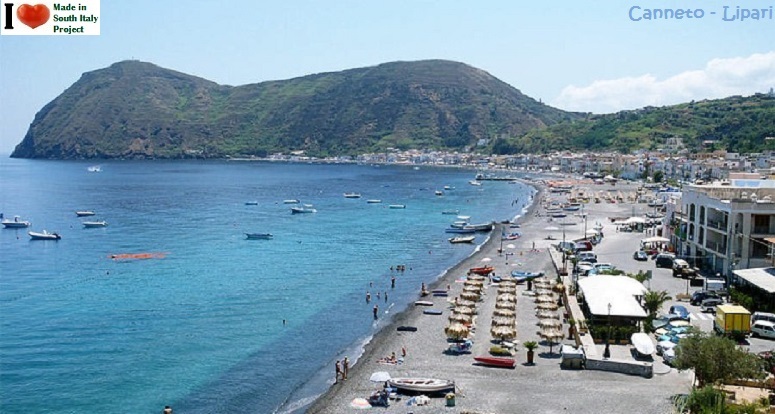 Its coastline is mainly composed of gravel , an old iron pier extends into the water for almost 100 m.
Lipari is the largest of the Aeolian Islands in the Tyrrhenian Sea off the northern coast of Sicily, and the name of the island's main town. Its population is 11,231, but during the May to September tourist season, the total population may reach up to 20,000. 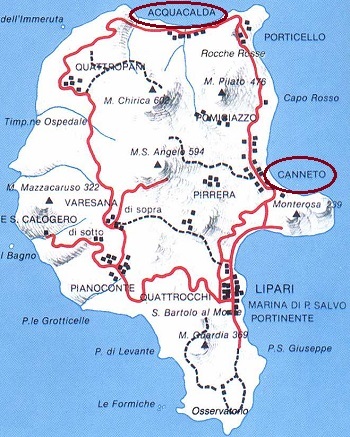 Besides the main town, most of the year-round population resides in one of the four main villages: Pianoconte is almost due west across the island, Quattropani in the northwest, Acquacalda along the northern coast, whereas Canneto is on the eastern shore north of Lipari town. 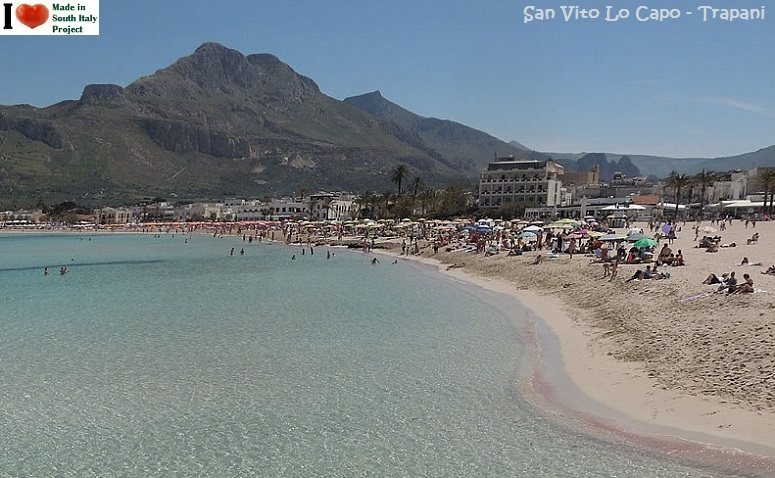 San Vito Lo Capo in the province of Trapani is one of Sicily's most famous tourist destination, a pristine area rich in history and culture. The town's primary industries are tourism and agriculture, particularly olive groves. The mountain is popular with local climbers, and home to numerous caves, most of which are inaccessible without professional climbing gear. Hiking, hiking, walking, canoeing , diving, horseback riding are some of the outdoor activities that you can play in peace even in the non-summer months. 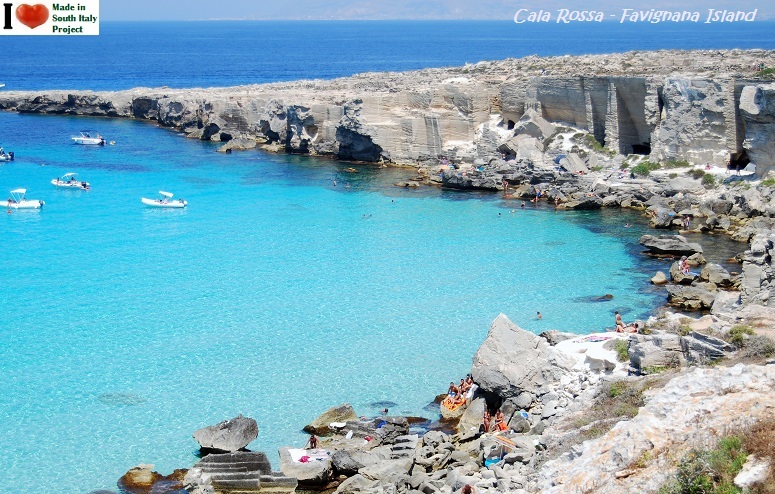 On the "Trapanese" coast, about 60 km from Trapani, is the beach of Torretta Granitola, a sought after holiday destination (in the summer months) attracting tourists in search of rest and crystalline sea. A large hotel complex called Kartibubbo Village, is nearby providing accommodations to about three thousand people. The complex consists of several buildings used as timeshares, and some semi-detached houses used for the summer. Currently the whole area is the subject of attention from well-known tour operators. Beach Vendicari near Noto (Siracusa province) is located inside the naturalistic Park of Vendicari, dominated by a Swabian tower. The coastline is well preserved thanks to environmental constraints in place. A beautiful beach, soft white sand, turquoise, crystal clear and transparent water, all bordered by dense Mediterranean vegetation. 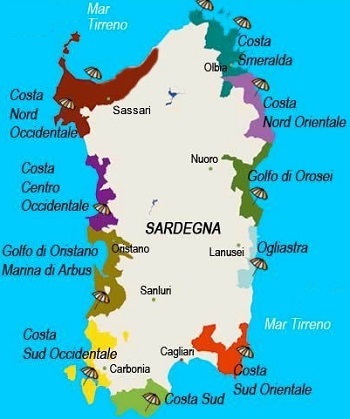 Marsala is located in the Province of Trapani in the westernmost part of Sicily. The most populated town in Trapani District and the fifth in Sicily. Famous for the docking of Garibaldi on 11 May 1860 (the Expedition of the Thousand) and for its Marsala wine. Marsala was built on the ruins of the ancient Carthaginian city of Lilybaion, and includes in its territory the archaeological site of Motya island, an ancient Phoenician town. 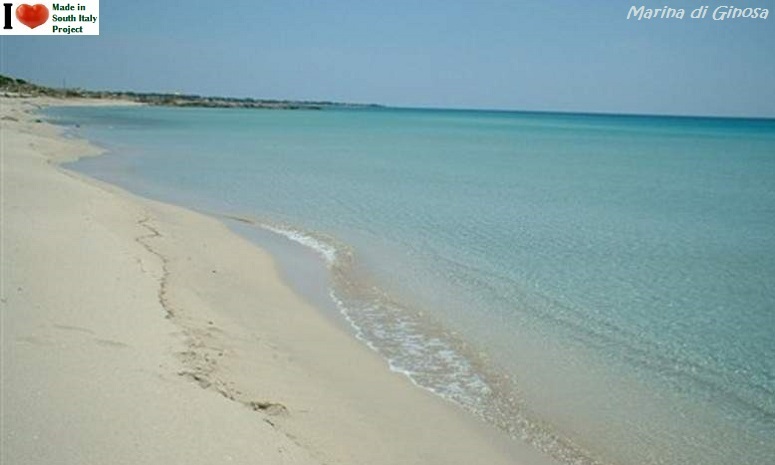 The beach Signorino is not far from Marsala, a popular spot for its crystal clear waters. Mostly used by locals. A car is a must. 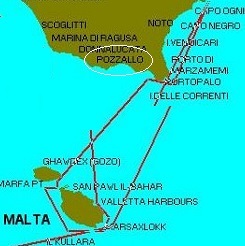 Pozzallo (province of Ragusa) is a popular location to visit over the summer. It attracts tourists from all over the world. During Ferr'Agosto (2nd-3rd week of August) many of the tourists camp out on the beach, around bonfires. 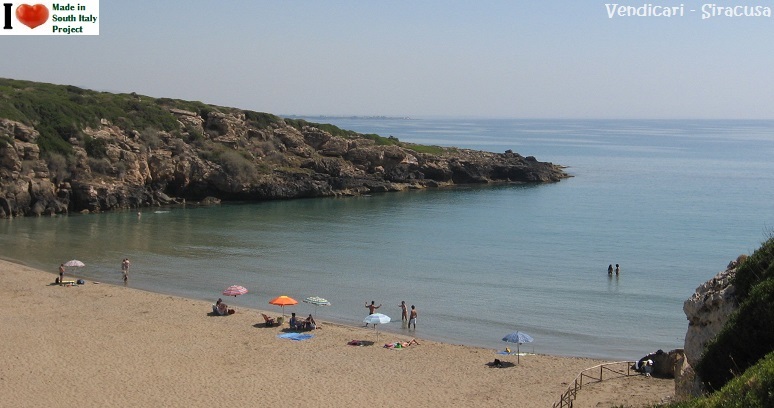 There are a few more beaches nearby and 4 of them often are awarded the "Blue Flag" a prestigios award given to beaches which meet strict criteria dealing with water quality. It is also a major port and a link to and from the island of Malta (about 90 minutes on high speed ferry). There are few places in the world like the Italian island that offer such a contrast of beautiful beaches where you can spend the holidays, and if the main ingredient of your vacation are sea and sun, it is normal to ask what are the most beautiful beaches of Sardinia. 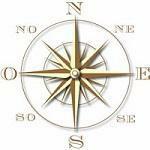 Indicating one rather than another might prove to be a very difficult task. The coasts (with a total length of 1,849 km) are generally high and rocky with ample and deep bays surrounded by islets. The northern coast (facing the French island of Corsica) - Stintino, Platamona, Castelsardo, Costa Paradiso, the beaches of Vignola and Portobello, the beautiful bays of Aglientu and Santa Teresa, the islands of La Maddalena and Caprera and the wonderful smaller islands of the archipelago, where you will find some of the most beautiful beaches on the island. The Catalan language is co-official in the city, unique in Italy. The language was introduced when Catalan settlers repopulated the town after the Crown of Aragon conquered the city from the Genoese in 1353 and subsequently expelled the indigenous population. The Catalan was replaced as the official language by Spanish in the 17th century, then by Italian. 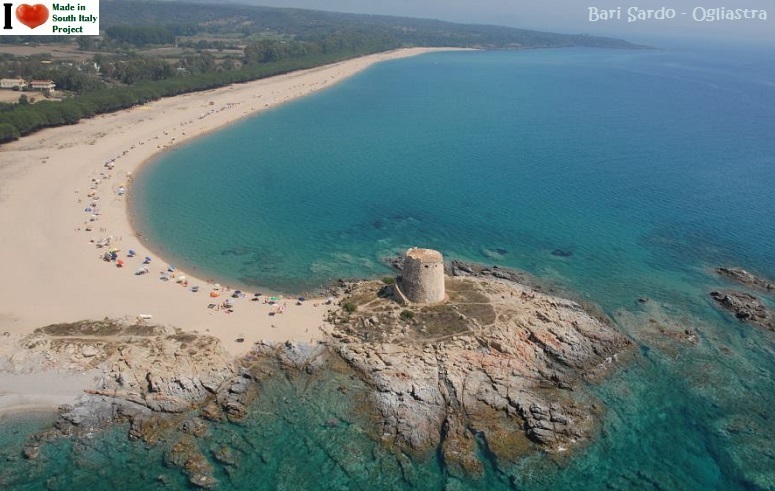 Bari Sardo in the Province of Ogliastra, about 80 kilometres (50 mi) northeast of Cagliari, the region capital. Buggerru is a comune (municipality) in the Province of Carbonia-Iglesias, about 70 kilometres (43 mi) northwest of Cagliari and about 30 kilometres (19 mi) northwest of Carbonia. White sand and blu sea. 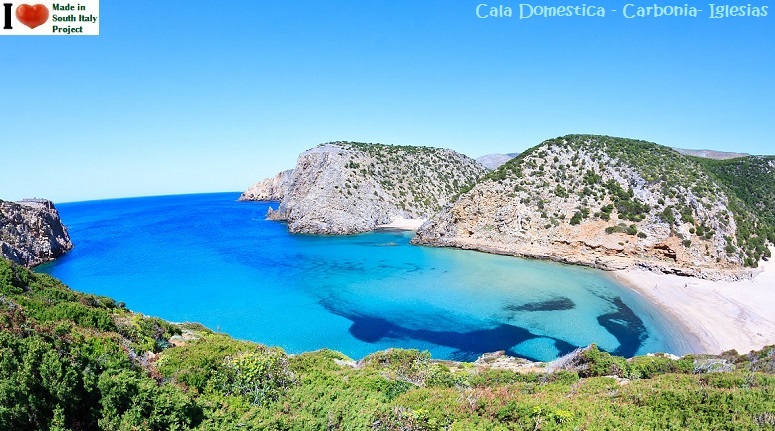 Beautiful Cala Domestica is easily reached by following the SP 83 provincial road. Just before reaching the town o Buggerru, signposts are found for the beach. The beach is very wide and the area also offers numerous facilities, such as an ample car park suitable for campers & vans, cafe, refreshments, and it is characterized by shallow waters which allow children to play safely in the sea. Overcrowded in August. 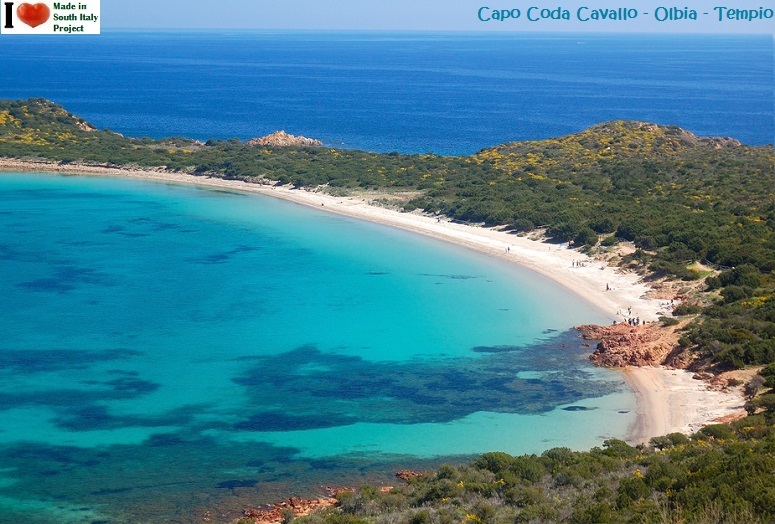 Capo Coda Cavallo is a granite promontory in the historical region of Gallura. It spreads across the Tyrrhenian Sea to the south of the Gulf of Olbia, in the municipality of San Teodoro, in the province of Olbia-Tempio. 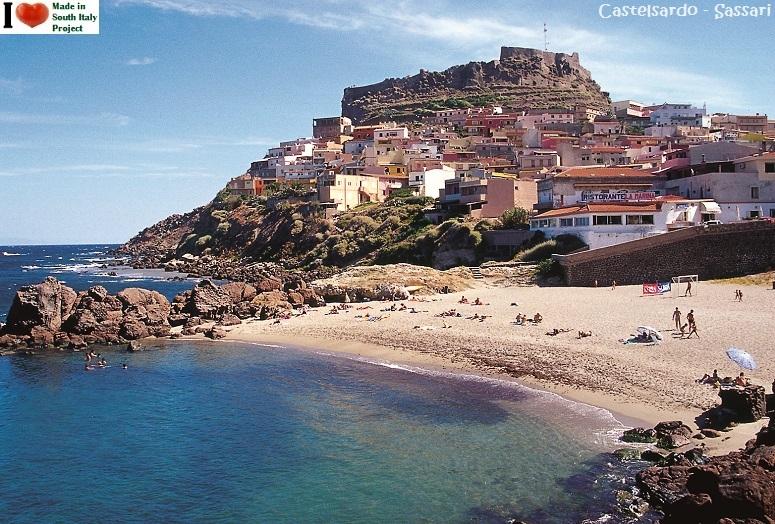 The town of Castelsardo is located in the northwest of the island within the Province of Sassari, at the east end of the Gulf of Asinara. 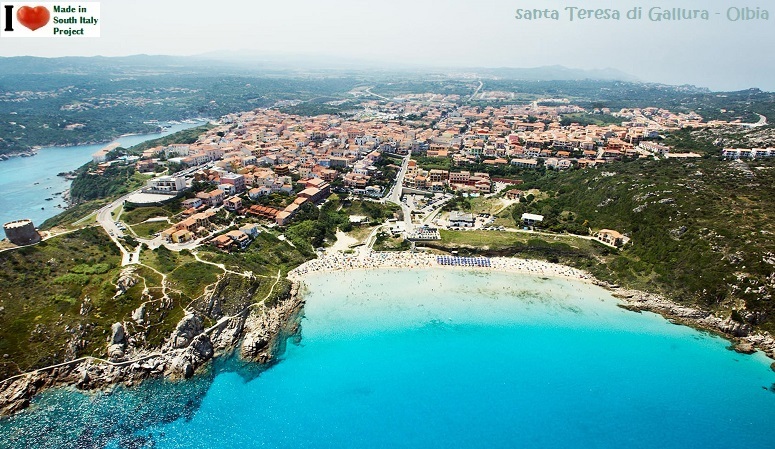 Santa Teresa Gallura on the northern tip of Sardinia, on the Strait of Bonifacio, in the province of Olbia-Tempio. Most likely, you might find the beach a bit overcrwoded in the months of July and Augus . The southern coast of Corsica can be seen from the beach. La Maddalena is a town located on the island with the same name, in northern Sardinia, part of the province of Olbia-Tempio. 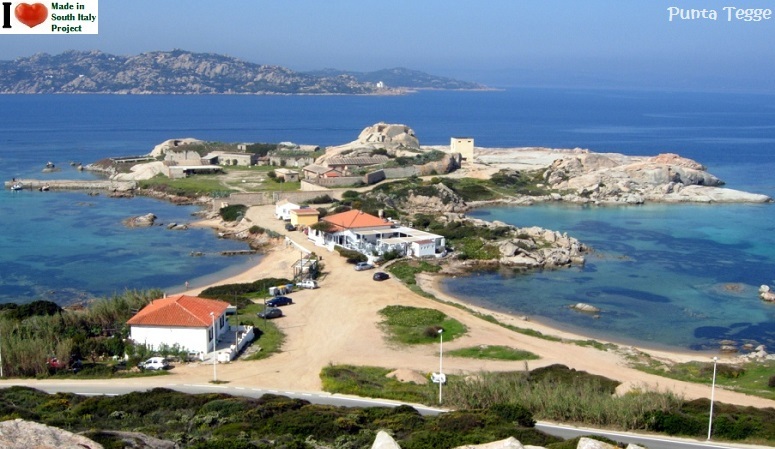 The island of Maddalena is renowned for its beaches; it is characterized by rocky granitic terrain and has some ancient fortifications. 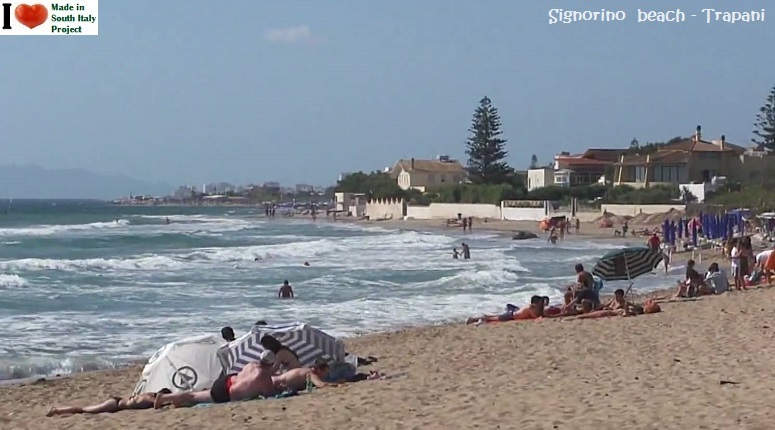 Spalmatore and Bassa Trinita are two popular beaches. 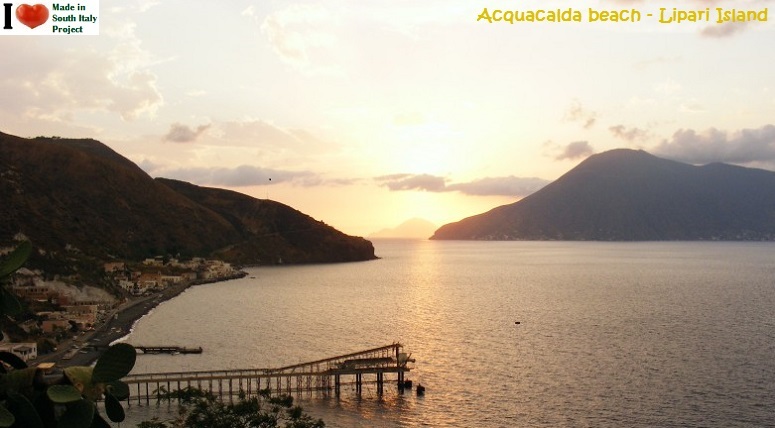 Nearby is the island of Caprera, famous as the residence of the Italian revolutionary Giuseppe Garibaldi. 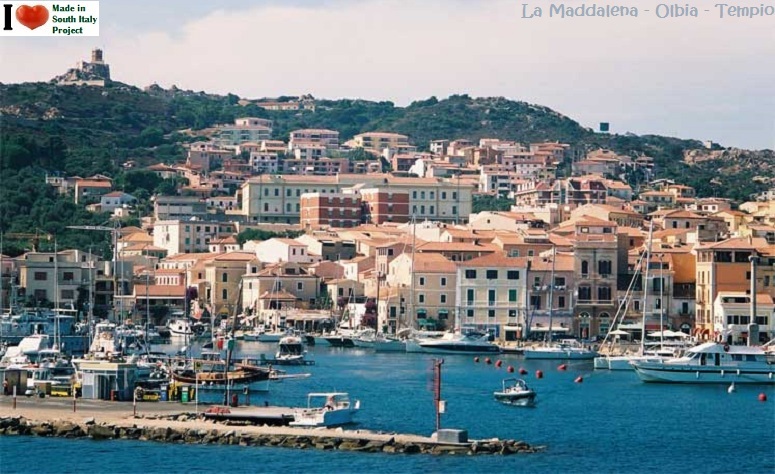 Punta Tegge is also located on the Island of La Maddalena. The beach is made up of coarse-grained sand lapped by the emerald coloured waters. It has plenty of facilities and it is characterized by its shallow waters that make it great for children to play. It is also a great favorite with scuba divers. 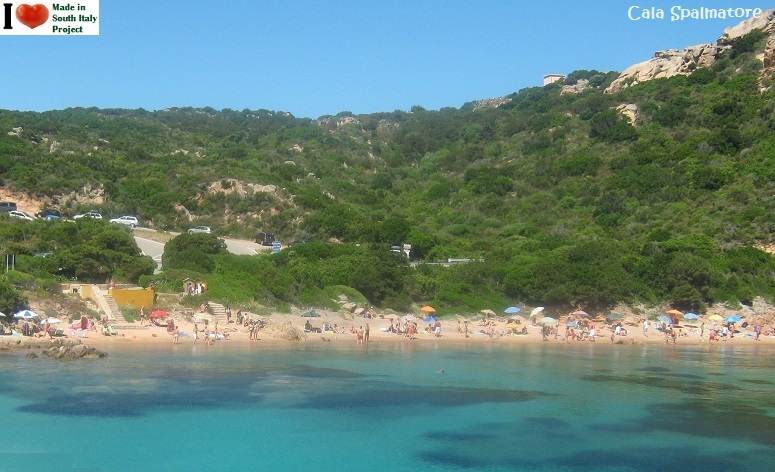 The beach of Cala Spalmatore,on the eastern coast of the Island of La Maddalena, has a cream coloured coarse-grained sandy shore, lapped by a sea with shallow waters. It is framed by green Mediterranean shrub and enhanced by splendid pink coloured rocks. From the Guardia del Turco(Turks’ Lookout) above the beach, you can admire the panorama that takes in the western coast of La Maddalena and the western coast of the Island of Caprera. 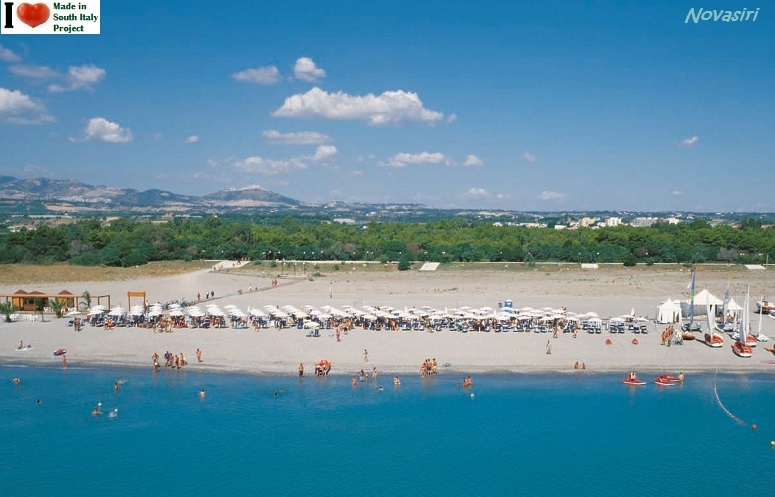 Just a thirty minute drive from the port and airport of Olbia, in the province by the same name is the beach of San Teodoro. The water is turquoise, transparent and ideal for small children, as it is shallow on the beach, very gradually become deeper for swimmers and snorkellers. For watersports lovers, surfing, windsurfing, sailing, canoeing, scuba diving and boat hire is available, and for sports lovers in general, horse-riding, trekking, cycling, tennis and golf are all available in the close vicinity. 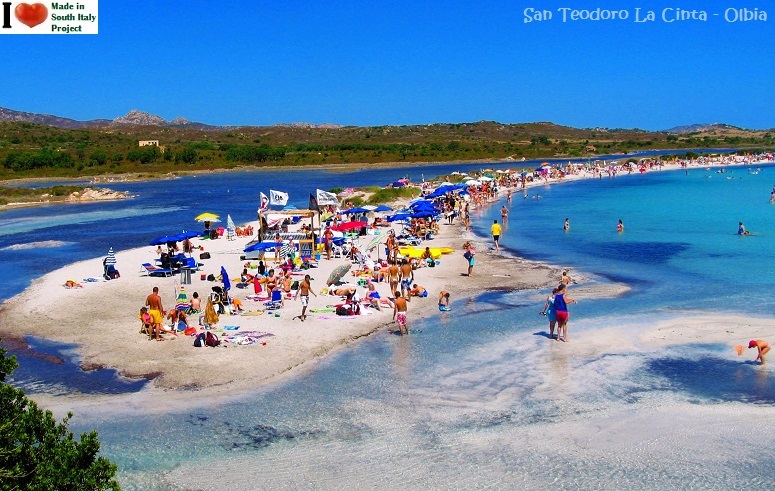 Apart from the beauty of the beaches and coastline, San Teodoro is also of great interest to nature lovers, with characteristic salt lakes hosting flamingos, varied and rare bird life and fauna. 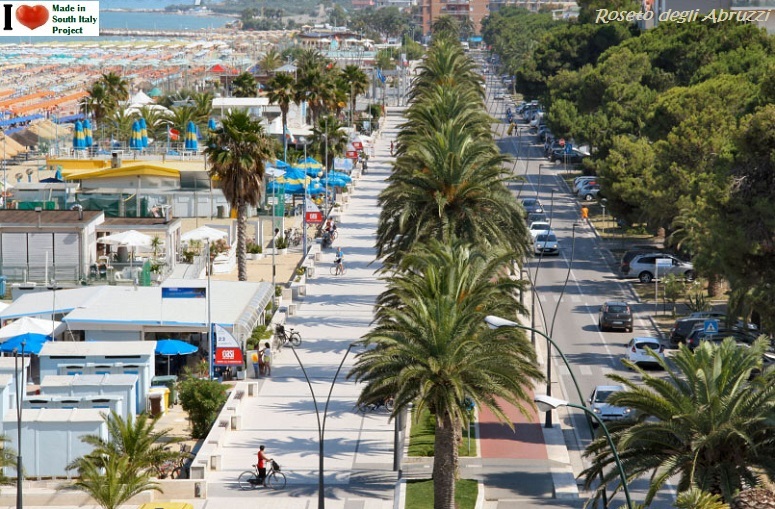 We are now in the province of Cagliari , South side of Sardinia known as the South Coast (Costa Sud), with Poetto being Cagliari's main beach. It stretches for about eight kilometers, from Sella del Diavolo (the Devil's Saddle) up to the coastline of Quartu Sant'Elena. 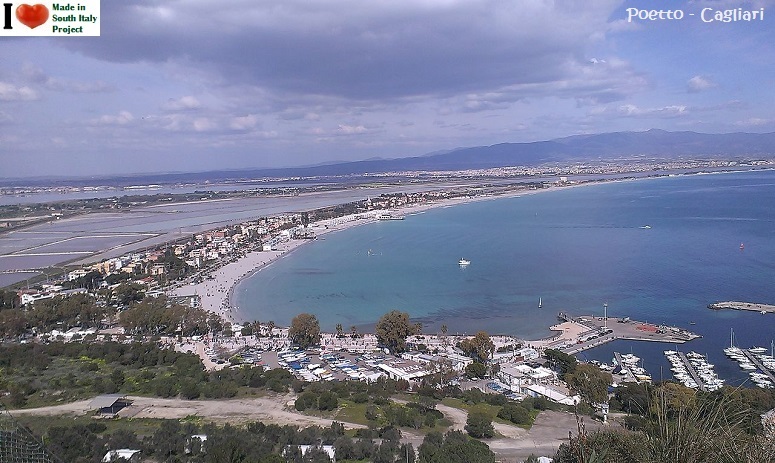 Poetto is also the name of the district located on the western stretch of the strip between the beach and Saline di Molentargius (Molentargius's Salt Mine). A walk up the headland, along a nature trail starting at Calamosca, a bay flanking its western slope, in less than one hour offers a sweeping vista embracing the whole city and the beach. 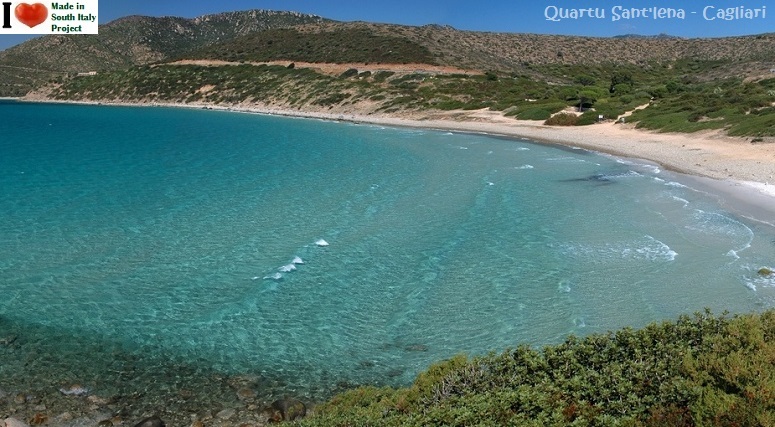 Quartu Sant'Elena, Cagliari province, only a few km away from the city (Cagliari) . The area is known for its beautiful beaches. The coastline starts from Poetto beach and unfolds in a breathtaking panorama, alternating stretches of towering cliffs with fine, sandy or pebble beaches, such as Cala Regina, Is Mortorius and Mari Pintau, meaning ‘painted sea’ due to the wonderful shades of the limpid water. 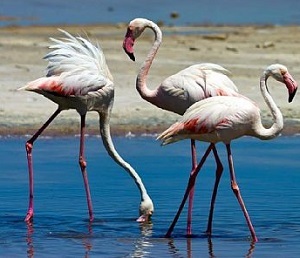 The town borders on the salt lakes and marshlands of Molentargius, a natural oasis protected by the European Union, where visitors can admire colonies of pink flamingos (Fenicotteri), which nest only in the south of Sardinia and in southern France. 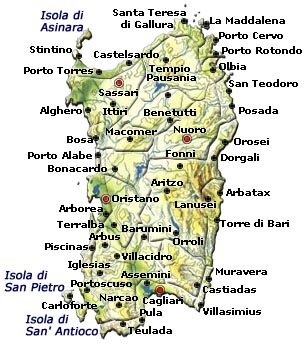 Oristano is the capital of the Province of Oristano, in the central-western part of the island. The economy is mainly based on services, agriculture, tourism and small industries. 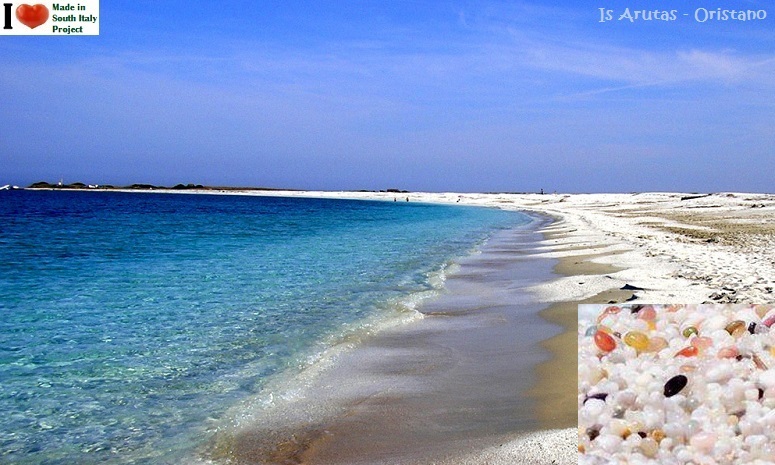 The beaches of the province of Oristano are in many ways still wild and pristine, they are far from mass tourism that you can find in other places on the island. 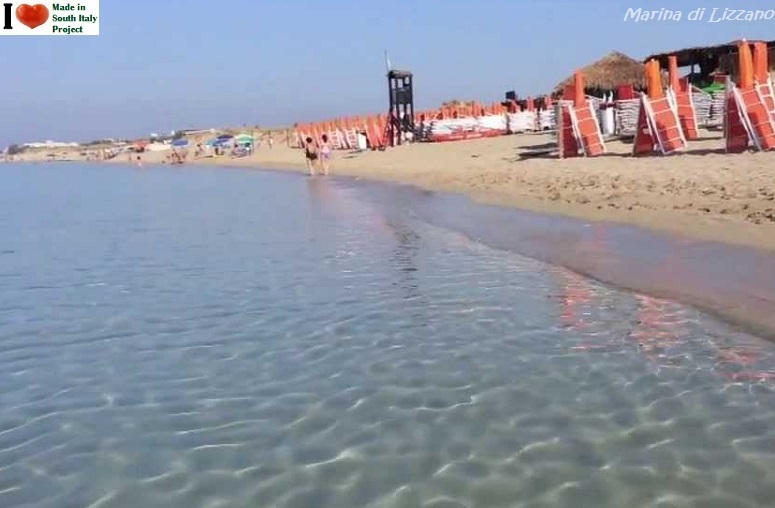 The coast is less tourist exploited but nonetheless very beautiful: while on holiday in Oristano you'll be spoiled for choice, and you can choose to visit a different beach every day, thanks to the ease of connections. Is Arutas, Mari Ermì, Putzu Idu, S'Archittu, or the romantic small Beach of San Giovanni di Sinis, in the homonym peninsula, will surprise you for their simple beauty. One of such beaches, Is Arutas, a few hundreds of meters long and famous for its grains of quartz, round and pink, light green and white.